The Ripper suits are quite fun models, although I would rather weapons-towards-enemy poses to the bursting-into-song poses. As modifying the models would be time consuming and quite a bit of hassle I decided to leave them as supplied. 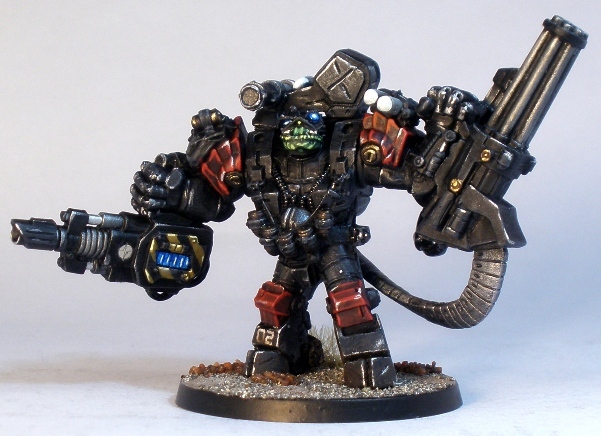 I will get over it, plenty of miniatures suffer from that star jump look. 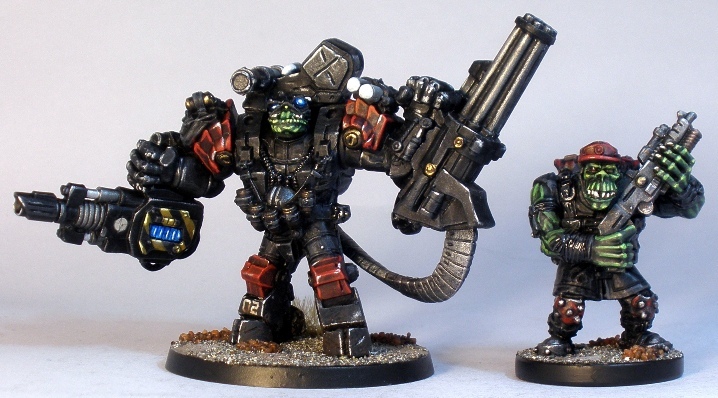 Obviously, these models are well suited to representing more high tech Mega Armoured orks than the current dilapidated, ramshackle GW equivalents. The Commandos are basic, rifle equipped grunts. The style of the models harks back to last centurys GW Blood Axes, with a less alien barbarian look and more of a sci-fi merc look. Or else an intergalactic WWII look maybe, I dunno. The Marauders are slightly taller than the GW equivalent, but the Deadzone guys dont have that unusual arse-sticking-out, “S” shaped spine look that the GW guys have. The Mantic figures stand a little straighter. I have zero issue with mixing the two model styles in my games. 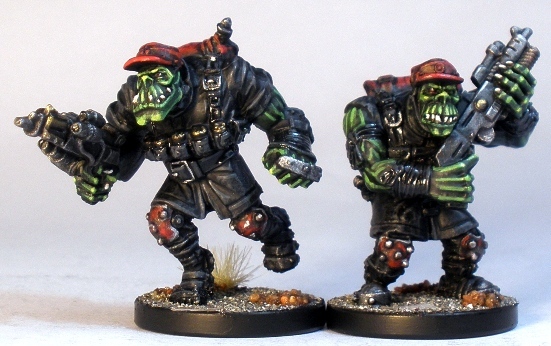 As long time readers may be able to tell from the photos, I decided to paint my Deadzone Marauders to match my other “Bigdogz” orks. 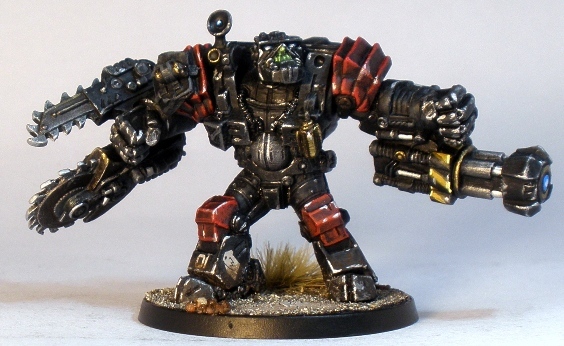 The black and red is a simple scheme that works well with the green skin. Its not a colour scheme that is going to win any points for originality, but its reasonably quick to paint and looks pretty good I think. 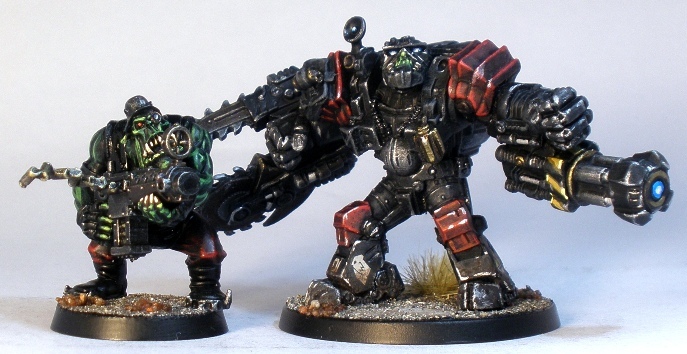 L to R: GW ork (with a Kromlech head), Deadzone Mauler Class Ripper Suit. I wanted the suits to look like they had been around the block, but not that the were poorly maintained, rusty or falling apart. I got a bit carried away and overdid the weathering and chipping on the Mauler class Ripper. I will be slightly less heavy handed on the next Ripper. The level of wear and tear on the Rainmaker looks about right to me. 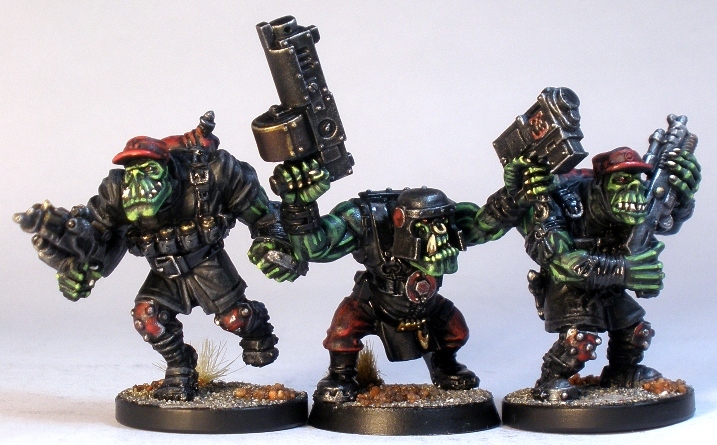 I have been batch painting orks/orx/orcs/goblins/gretchin alongside these figures, so there should be more orkoids from various manufacturers showing up here over the next while. A bit of a dodgy photo. Getting those… somewhat expressive guys to fit into a group shot was tough.